Take a drive through Miami Beach’s Venetian Islands and you’ll notice a quiet transformation taking place compared to years past. On Di Lido, the third Venetian island from the east, about 15 homes are under construction, older homes are for sale, and vacant lots are on the market. The island is a snapshot of the current movement in Miami Beach to tear down older homes and build modern mansions. The Real Deal took a tour of Di Lido, nestled between San Marino and Rivo Alto. 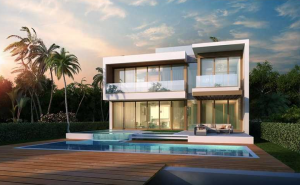 A double lot at 212 West Dilido Drive, for example, has been turned into a modern, multimillion-dollar mansion with the highest sea wall on the island at 7.5 feet tall. It was listed for sale in December for $35.9 million. The property features walls of sliding glass doors, meant to break the separation between indoor and outdoor space, a home theater, serenity den, a two-story fireplace and an infinity edge pool with a splash area. Khamsi, president of SuperCable, a Venezuelan cable company, paid $962,500 for the 21,000-square-foot lot in 2011, according to Miami-Dade property records. Khamsi said there is heightened demand for high-end homes on double lots. He hired Julian Johnston of Calibre International Realty to list the mansion, which has more than 100 feet of bay frontage, seven bedrooms, nine bathrooms and two half-bathrooms. The property, designed by Choeff Levy Fischman and named Casa Clara, includes a private master wing, glass-enclosed wine room and an additional catering kitchen. Choeff Levy Fischman has 14 properties either completed, under construction or under design on Di Lido. Those completed include 212 West Dilido, 303 East Dilido Drive and 440 West Dilido Drive. There are 166 parcels on the island, excluding three owned by the city of Miami Beach. Property records show that 96 are waterfront and 69 are dry. Architect Paul Fischman toured the island with TRD, and said minor details make Casa Clara stand out, like recessed walls instead of baseboards and linear drains in the showers, as well as grand features like an outdoor wall water feature by the entrance. Johnston said part of the reason why there is so much new construction on the Venetian Islands is because the older homes were built like beach houses with smaller bedrooms, bathrooms and living space. Despite the overwhelming number of contemporary newly built and under construction homes, a handful are Mediterranean-style. At 726 West Dilido Drive, EWM’s Nelson Gonzalez is listing a Mediterranean-style home that was completed in 2010. It features an open floor plan, high ceilings, an infinity pool, marble floors and a high-end appliances. The property is on the market for $10.5 million. The newly completed, Mediterranean-style mansion at 27 East Dilido Drive replaced a 1936-circa home on the south side of Di Lido, next to two homes, 33 East Dilido and 35 East Dilido, which are also under construction. Time Warner’s executive vice president and general counsel Paul T. Cappuccio paid $2.7 million for the lot in 2004, property records show. Sea-level rise has also contributed to new construction on the islands, brokers and architects said. Concerns about coastal flooding, especially in Miami Beach, have led to the raising of homes and sea walls, and the city’s installation of storm water pump stations. Before 2000, “not too many people were building new [homes] because there was no demand for it,” Johnston said. Developer Todd Glaser, Ramin Design and Development, architects Max Strang and Kobi Karp are also active on the island. At 500 West Dilido Drive, Gonzalez of EWN is listing a two-story spec home with six bedrooms, six full bathrooms, a pool with a water feature, frameless doors, wood floors and an open floor plan. The mansion, which will be completed next year, has 60 feet of water frontage. In fact, homeowners on the island include restaurateur Myles Chefetz, Huffington Post co-founder Ken B. Lerer, Time Warner General Counsel Paul Cappuccio, and Invesco Senior Managing Director Colin D. Meadows. Johnston, Fischman and Ralph Choeff all said that there are more end-users building new properties than spec homes. Choeff designed a two-story, 5,600-square-foot mansion on San Marco Island for Avra Jain in 2007. That property, which has a new owner, was listed in October for $13.5 million. A local radiologist purchased a 3,200-square-foot home, built in 1956, in 2012. Nisha Mani paid $1.45 million for the property at 430 West Dilido Drive, which has since been torn down. Mani filed notices of commencement with the county in 2015 and 2016, records show. The Jills’ team at Coldwell Banker also has a handful of listings on Di Lido, including a vacant 13,300-square-foot lot at 845 East Dilido Drive. 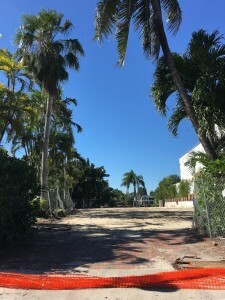 An LLC managed by a tax adviser owns the property, which is next to city of Miami Beach-owned land. It’s on the market for $7 million. Dora Puig of Luxe Living Realty also has two listings, including a spec home at 412 West Dilido, designed by Strang. “Keep out, tree protection area” signs hang in front of an older home at 425 West Dilido. The property, which appears abandoned, was developed in 1945. It sold for $1.15 million in September. An LLC led by Lang Baumgarten, who developed a spec house in the Sunset Islands, was the buyer. “It almost costs more to renovate an old home than to build a new one,” Johnston said.